*Kindly take note that Mikuni is closed on Sundays. 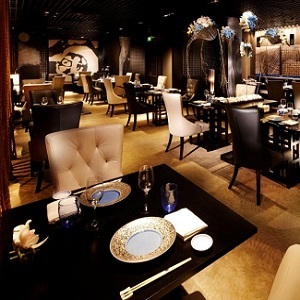 A name that means “Three Kingdoms”, Mikuni offers a culinary tour through exquisite creations from its three stunning Teppanyaki, Sushi and Robatayaki live stations, each helmed by a master chef, that highlight the most premium of seasonal Japanese produce. Be delighted with Mikuni’s multi-sensory dining experience and savour novel and exciting modern kaiseki dishes that seamlessly blend modern and century-old Japanese culinary techniques with a dash of theatrical humour. Excellent service from staff at mikuni with great teppan food! For a $95 prawn and steak set, it’s disappointing to know that frozen prawns are used instead of fresh ones. Staff are extremely helpful, even the teppanyaki Chef is friendly and personable. Made the whole dining experience very pleasant and enjoyable . wonderful and delightful as always ... well done not to mention good service. Jun Kit was very pleasant and provided us with a good service. The food was exquisite and service was excellent. Mr Keisuke Uno skillful in foods presentation. Quality of food is excellent. Same goes for service and ambience. Was there for lunch. Would be perfect if the lunch menu can be expanded. Some of my favourite items are missing, eg nasu dengaku. Was told need to order 3 days before. Most reliable place for great Japanese food over the years. That is why we keep going back! My dining experience at Mikuni on 6 April 2019 was superb, exceeding my expectations. The food was excellent coupled with good service as the serving staff, Sandra was attentive, friendly and extremely helpful. Ambience of the restaurant was also lovely. I always love Mikuni and what makes it our most favorite restaurant is apart from the amazing food is the service. The hostess Abegail is fantastic she remember us all the time and also our names, she never fail to give us our preferred table with or without reservations. She is always smiling and very positive and I think this makes a very big difference from other place. Thank you and we will always love to come back to Mikuni! There was a crowd and it seems there wasn't enough wait staff around. Having sat at a corner, we had to wait a couple of minutes to get attention or get the bill. On the bright side, we casually inquired about Lobster Maki that wasn't on the menu. The waitress kindly asked the chef if he could prepare the dish, and the chef obliged. Great meal, the cod was exceptional. Price was on the high side. Overall good experience. Hope to be back again! The price and food quality is mismatched.